Hello, HALO! 200th Post! Review and GIVEAWAY! Happy 200th post to me!! And – yay! – I’m celebrating with a giveaway! Think I’m gonna stop with all the exclamation points? No way, I’m too excited! 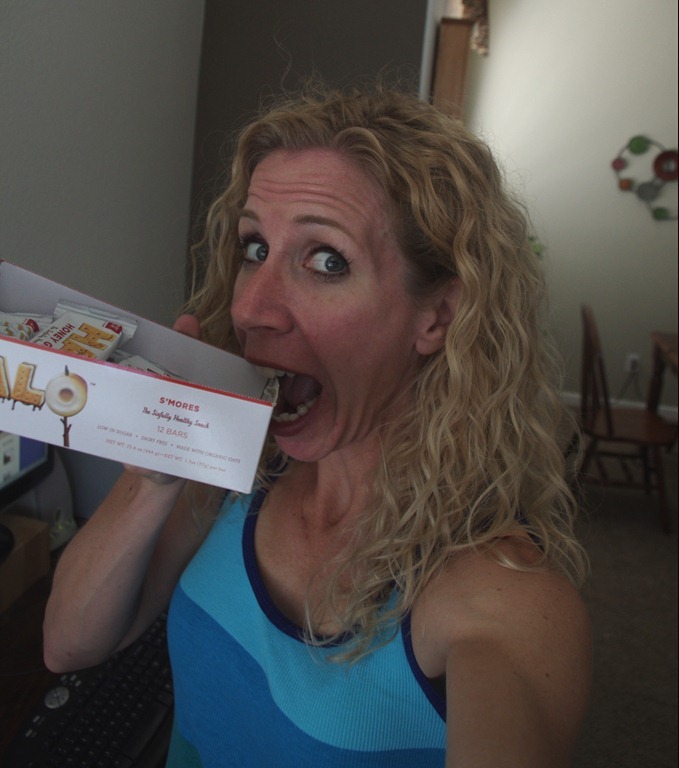 Obligatory wildly unflattering photo of me trying to eat the whole box. I’m not a super healthy eater. In fact, I’m something of a recovering Cheeto-aholic. I have eaten a bag of microwave popcorn and called it dinner (don’t you judge me – popcorn has a lot of fiber; thus, it is a health food). But last year, when IronHubs was training for Silverman, we started cleaning up our eating a little bit at a time. I’m not going to act like I never microwave dinner anymore, but I’ve at least started to make some healthier choices. One of the biggest changes I’ve made is really reading labels on my prepackaged food. I’ve always paid attention to fat and calories and whatnot, but I’ve never given a lot of thought to what the food is made of. Nowadays, if there are lots of ingredients I can’t pronounce or don’t recognize, I (probably) won’t buy it. S’Mores – when my box arrived, I ripped it open and devoured one of these puppies right away! Yes, please, I would like s’more! Rocky Road – super chocolatey and nutty! I don’t like rocky road ice cream at all, so this was the last flavor I tried, but I was very pleasantly surprised by how yummy it was. Nutty Marshmallow – this one could actually be a tie for second place with the rocky road, it depends on whether or not you’re in a chocolate mood. Ha, ha – like there’s such a thing as “not a chocolate” mood! I crack myself up. Honey Graham – the only reason this came in fourth place is because I’m not a huge graham fan. I like graham crackers, but only after I’ve eaten all the chocolate chips in the house. They’re very, very moist. In my opinion, this is a good thing. I like chewy cookies more than crunchy ones, soft granola bars more than crispy ones, cake more than celery, etc. They’re totally nutty. Not like they tell zany jokes or love a good whoopie cushion, but they’re actually full of nuts. Again, this is a good thing. I keep nuts in the house all the time for a quick snack because I love ‘em. They’re super sweet. You could easily eat them for dessert. In fact, I did. They’re much more filling than I expected. When I opened the first one (at about 1:30 pm), I’ll admit, I was a little disappointed because it was sort of small, but after I ate it I was full until dinner. And I’m generally a two-snacks-in-the-afternoon sort of girl. They’re hearty. By this I mean they’re not an especially low-cal or low-fat snack. The 1.3 oz Rocky Road bar has 160 calories and 8 grams of fat, so it’s more robust than just a light snack. It’s a lot of good fat, of course, from all the nuts, but still, you probably don’t want to plow through three of them at a sitting. Mandatory – Be or become a follower of my blog. Thank you! Mandatory – Go to the PROBAR website and check out all their delicious flavors. There’s way more available than just the HALOs! Tell me which one is/would be your favorite. Yes, this means you could have up to nine entries to win! I will accept entries until next Monday, September 12 and announce a winner on Tuesday. Good luck!! What if you can’t wait to win and you love a good bargain? Oh, yeah, baby, I’ve got a discount code for you! Head on over to PROBAR’s online store and enter the code BLOGGER at checkout for 40% off your first purchase!! Don’t say I never did anything for you. Happy Labor Day Weekend! Those Moka Koka Probars seem like they might be tasty. I like chocolate and coffee. I follow Probar on Twitter. I have tried some of the Pro Bars (PB&J namely), but I totally want to try the HALO bars! Any of them! ALL OF THEM! I had NO IDEA they were vegan, waaaaa! Hi P! Happy Labor DAy! The PB&J and the Moka Koka look awesome. I like PROBAR on fb! I follow your blog (follow and stalk mean the same thing, right?). I really want to try the HALO s’mores! I love s’mores and the bars would be a lot less messy than making the real thing. The sweet & savory coco pistachio sounds amazaaaazing!!! Lemon Fruition looks like it would be delish but the nutty marshmallow sounds like my cup of tea! For my favourite, I am going with smores for sure! Including this in a blog post that will be completed in about 30 minutes! I like probar on facebook. I want to try the old school PB and J.
I’d go for the old school PB&J bar! I have quite the sweet tooth, so all the HALO ones sound delish, but I also have a thing for cashews and the fruitation ones sound good too! I would love to try the S’mores. S’mores sounds right up my ally. Happy 200! I’m a follower of course!